Professional Carpet & Rug Cleaning in Mottingham. 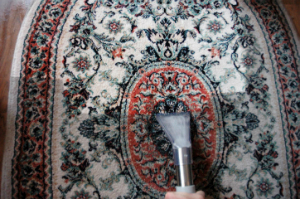 Do you want your rug to look as good as new once again? You can count on Thomsons Cleaning company to help you achieve this. We have been cleaning rugs and carpets professionally in Mottingham BR7 since 2006. All of our expert cleaners are fully police background checked, trained and experienced. We work with professional Prochem certified cleaning solutions which are completely safe for the environment, people and pets. Our cleaning equipment is of the latest generation from the leaders in the cleaning industry. We can clean any kind of rug or carpet, and can remove a wide variety of stains completely, no matter for commercial or domestic needs. To receive a free of charge offer, just contact our customer support center with details about the type of rug or carpet you want cleaned, its condition and its size. Call us 24/7 at 020 3746 0000 or online via the contact form here. It is a very good idea to move the heavy furniture off the carpet before the technician comes. The Thomsons Cleaning Mottingham BR7 expert is alone, so only light furniture can be moved off of the rug or carpet before the cleaning. The expert hoovers the carpet with a professional vacuum. Then does a very detailed inspection of the carpet or rug. The point is to determine the exact type of material it is made of, as well as its overall condition. The dirty, heavy traffic areas will be pre-treated with the appropriate solution. The cleaner will inform you which stains are treatable and which are not, and will proceed to pre-treat the ones which are removable. All solutions are tested on small areas of the carpet before being applied on it. Professional carpet and rug cleaning is one of the demanded and most popular services of Thomsons Cleaning. We have been deep cleaning the rugs and carpets of the people, businesses and public agencies in Mottingham BR7 for more than a decade. The number of pleased customers keeps growing each year. Our well-equipped and skilled cleaning technicians are trained and experienced to safely and efficiently clean any type of carpet. We can even handle the most precious, antique or delicate rugs. Our services are fully insured, and we always perform tests on small hidden spots of the carpet of every solution we are about to use just in case. You can feel safe in the hands of our professional carpet and rug cleaners. This type of Thomsons Cleaning Mottingham BR7 service is suitable for more delicate rugs, or rugs and carpets made of natural textiles which can shrink, or for carpets which are not colourfast. The dry cleaning solution is applied on and into the carpet with a specific machine with hundreds of mini brushes. It is left to sit for as long as it is required, and then it is hoovered off with a professional vacuum cleaner. The Mottingham BR7 expert mixes the appropriate cleaning solution with water in the tank of the professional carpet steam cleaning machine and waits for it to reach its boiling point. The cleaner uses this powerful water extraction machine to shampoo the rug or carpet. Then the same machine is used but only filled with water for rinsing the rug. During the washing and rinsing, the water extraction machine actually extracts about 95% of the water used, which is crucial for the faster drying of the carpet and for avoiding damage to it or the flooring beneath it. Upon request, we can add protective Scotchgard or deodorise to your carpet. We can also use air moving machines for more quickly drying. To book our very affordable carpet or rug cleaning service in Mottingham BR7, contact our 24/7 customer support operators at 020 3746 0000 or use the online booking request form here. You will receive a text message and an e-mail confirming your booking within 2 hours. No deposit is required. The price of the service is fixed, so there won’t be unpleasant surprises with hidden service fees at the end. If you choose to book one or more other services along with the carpet cleaning, such as: window or upholstery cleaning, we will give a very big discount. We are available for emergency cleaning as well as on every single day of the year. Without added charge for booking us for the holiday or on a weekend.